But there’s seldom a day off from drivers plowing into a Compo Shopping Center storefront. Have a safe and happy 4th. Be careful out there! 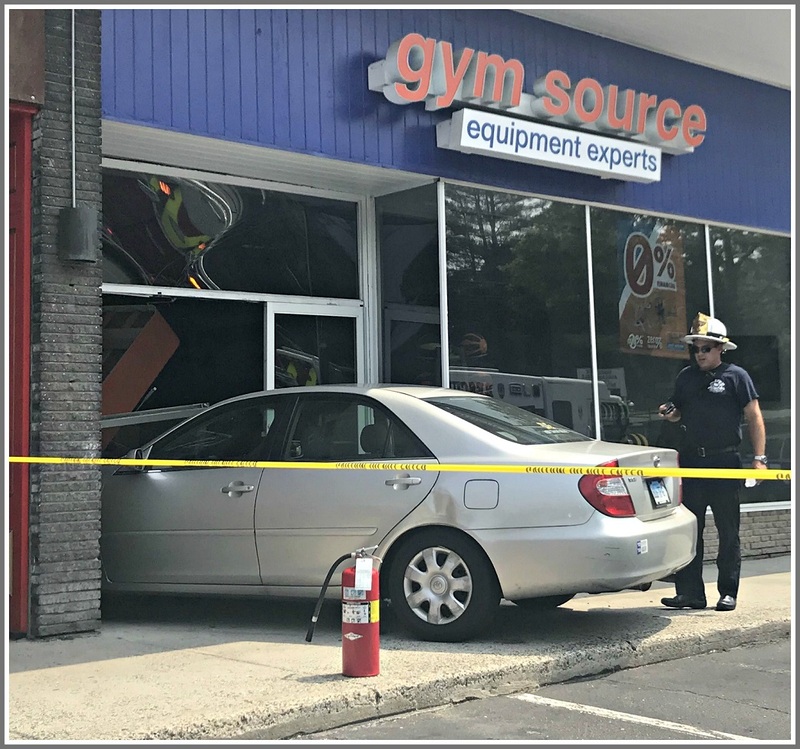 This entry was posted in Local business, Transportation and tagged Compo Shopping Center, Gym Source. Bookmark the permalink. Just can’t wait to start his/her fitness program. The shopping center needs barriers before someone really is seriously injured. Agreed. I can’t believe the owner has not installed any protection after dozens of these crashes. There really ought to be a Dan Woog 06880 contest for this, if it werent for the fact that several people have been really hurt. Someone I heard actually put their car in drive instead of reverse and drove it up the stairs next to Burger Lobster. That takes a level of creativity you don’t see every day. Cumberland Farms on Hillspoint & Post Road just put in 5′ high coated steel posts along the storefront to prevent just this sort of thing – I think that’s an idea that’s going to gain in popularity. That, or perhaps video instructions that light up on people’s phones when they turn on their car, showing a diagram, with arrows, and a voice-over, explaining how to choose between “R” and “D” on the transmission lever. There is a “Like” button for the blog at the top of the comments section. Unfortunately I can’t add one for each individual comment — sorry! Ok … happening once is one thing. But what is this … the 3rd or 4th time this year? Do we know if the drivers have been intoxicated? Or extremely elderly? This is bizarre. Obviously the cars were in the wrong gear, but maybe the curb is shorter than standard. wondering what’s the average age of all these crash drivers…….. Gives a new meaning to “Crash Test Dummies”. But, joking aside … this is bizarre how often it seems to happen, especially at that location. Serious question: Why does this happen so frequently on that side of that particular parking lot — but never on the CVS side? Very strange. Simple answer I suspect. Gold’s attracts a significantly older population than any of the businesses on the other side. And many studies have shown that these sudden accleration accidents are highly correlated with older drivers. David Webster: How old is this driver? I don’t remember seeing an age reported, not here nor at Westport Now. I believe the CVS side has cement parking stoppers, while the Golds side does not. Oops- I was wrong. No cement blocks on either side. The mystery continues. (Still, a cement parking stop is probably a good idea). It is a mystery. I just don’t understand why someone (property owner?) hasn’t put up some simple cement barrier poles along the edge of the sidewalk after so many cars have plowed through the windows. Isn’t this an obvious safety solution? Hopefully they’re not waiting until someone gets hurt to make an adjustment like that. We’ve been lucky on that so far. Good Lord – the employees in those stores are living in a combat zone!